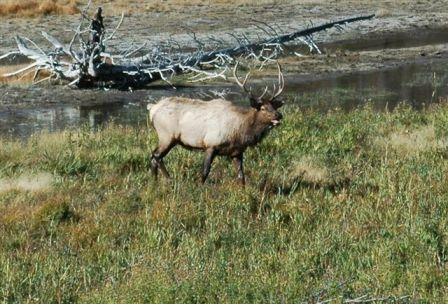 Habitat: Food, water, shelter and space are essential to elk survival. 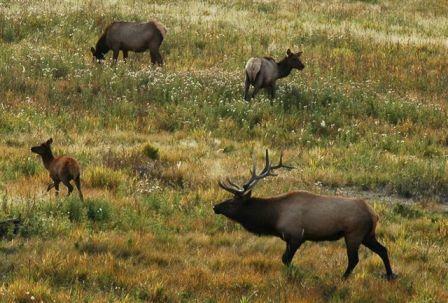 Elk live in a variety of habitats, from rainforests to alpine meadows and dry desert valleys to hardwood forests. In cold snowy climates, cows, calves and young bulls migrate to foothills and valleys in winter. An experienced elk, usually the lead cow, guides a herd between seasonal ranges. Range: Prior to European settlement, more than 10 million elk roamed nearly all of the United States and parts of Canada. Today, about one million elk live in the western United States, Wisconsin, Michigan, Minnesota, Pennsylvania, Arkansas, Kentucky, Tennessee and North Carolina, and from Ontario west in Canada. Color: Body varies from deep copper brown to light tan, rump patch light beige and legs and neck often darker than body. Calves: Typically born in late May through early June. Calves are born spotted and scentless. They spend their first few weeks hiding motionless while their mothers feed. Antlers: Only male elk have antlers. Bulls shed and grow a new set of antlers every year. New antlers are covered in fuzzy skin called velvet. Antlers harden by late summer and the velvet peels away. By September, antlers are solid bone. A set of antlers on a mature bull can weigh up to 40 pounds.